Lifespan analyses of forest raptor nests: patterns of creation, persistence and reuse. Structural elements for breeding such as nests are key resources for the conservation of bird populations. This is especially true when structural elements require a specific and restricted habitat, or if the construction of nests is costly in time and energy. The availability of nesting-platforms is influenced by nest creation and persistence. In a Mediterranean forest in southeastern Spain, nesting-platforms are the only structural element for three forest-dwelling raptor species: booted eagle Aquila pennata, common buzzard Buteo buteo and northern goshawk Accipiter gentilis. From 1998 to 2013, we tracked the fate of 157 nesting-platforms built and reused by these species with the aim of determining the rates of creation and destruction of nesting-platforms, estimating nest persistence by applying two survival analyses, describing the pattern of nest reuse and testing the effects of nest use on breeding success. Nest creation and destruction rates were low (0.14 and 0.05, respectively). Using Kaplan Meier survival estimates and Cox proportional-hazards regression models we found that median nest longevity was 12 years and that this was not significantly affected by nest characteristics, nest-tree dimensions, nest-builder species, or frequency of use of the platform. We also estimated a transition matrix, considering the different stages of nest occupation (vacant or occupied by one of the focal species), to obtain the fundamental matrix and the average life expectancies of nests, which varied from 17.9 to 19.7 years. Eighty six percent of nests were used in at least one breeding attempt, 67.5% were reused and 17.8% were successively occupied by at least two of the study species. The frequency of nest use had no significant effects on the breeding success of any species. We conclude that nesting-platforms constitute an important resource for forest raptors and that their longevity is sufficiently high to allow their reuse in multiple breeding attempts. Nest use pattern by the three species (booted eagle, common buzzard and northern goshawk). Circles represent number of nesting-platforms occupied in at least one breeding attempt by each species during the study period (1998–2013). 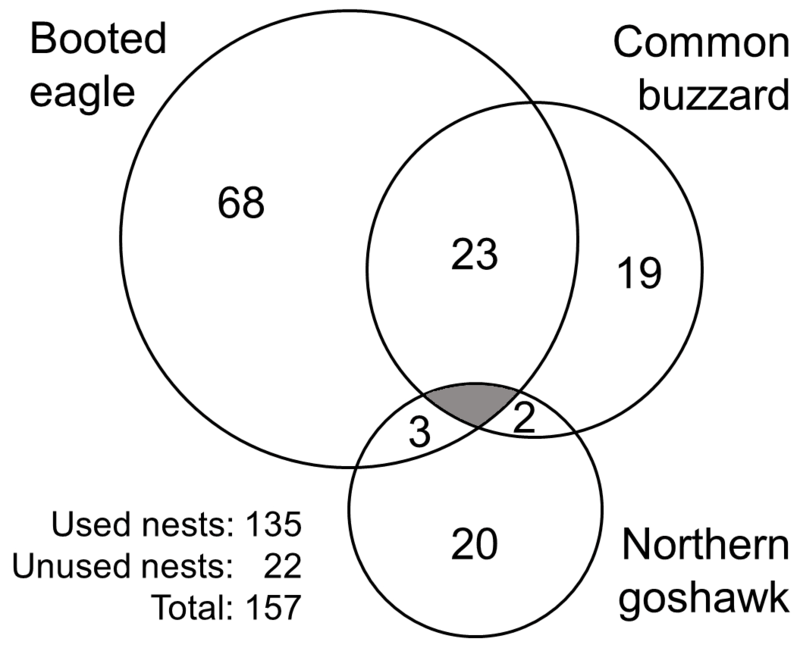 Note that some nests were alternately occupied by two species but no nest was shared by the three species (shaded area). In summary, the fact that the study area is not affected by human perturbation provides a good opportunity to analyse the patterns of nest creation and destruction, nest persistence and reuse by forest raptors in a Mediterranean forest ecosystem. We conclude that nesting-platforms are important breeding resources for the occupancy and viability of the studied forest raptor community and should be conserved since nest construction rates are low, most of the nests constitute a territory with only one nest and nests persist for a sufficiently long time to permit the forest raptor community to enjoy a high rate of nest reuse and alternation. In short, all the forest nesting-platforms should be kept in order to preserve an adequate supply of breeding sites for the raptors in our study area.